The Enterprise crew goes unconscious after developing a condition where they obsess over trivial matters. Which would be fine were it not for the fact that they were heading toward a black hole. So we go from an enraging episode in "The Communicator" where nothing made sense to a completely boring episode in "Singularity" where everything makes sense, but nothing happens. The teaser scene has all of the crew taking a nap, presumably because of how long rehearsal was going. The only one awake is T'Pol which is because, for whatever completely convenient reason, what's affecting the crew doesn't affect Vulcans. I'll do you a favor and sum it all up in one paragraph. Basically, an anomaly in the trinary star system that housed the black hole caused everyone to go crazy and focus on trivial things. 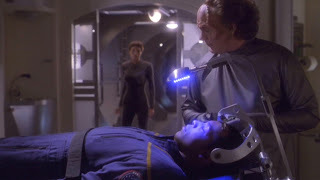 Trip needed to fix the captain's chair, Archer needed to perfect an introduction to his father's biography, Phlox needed to fix Travis's headache, Hoshi needed to perfect some kind of Asian recipe, Reed needed to come up with a security protocol. The closer they get to the black hole, the more they obsess over everything and snap at people who try to take them away from it until they eventually pass out. T'Pol wakes up Archer and they pilot the ship away from the black hole... and then everyone wakes up. Do it, Phlox. Cut his brain out. That's it! That's all there really is to the episode! There is absolutely no point to any of this except for Reed's security protocol which turns out to be the genesis of the Red Alert. The "Reed Alert" turns out to save their butts when they try to pilot the Enterprise through some large asteroids and need the weapons to be active. I hate that this review has been so short, but there's really... nothing to it. It's like the only reason they made this episode was to introduce the Red Alert, and everything else was just filler. There was nothing interesting here. Move along.